Flight Attendant Resume is essentially used to highlight the features of an applicant and impress the HR Department. The HR Department looks for key elements in the resume which when included in the cover letter and the Resume Templates, can potentially offer the most sought-after flight attendant jobs to the applicant. The resume is the basic step which can help the applicant advance to the next level of the hiring process. 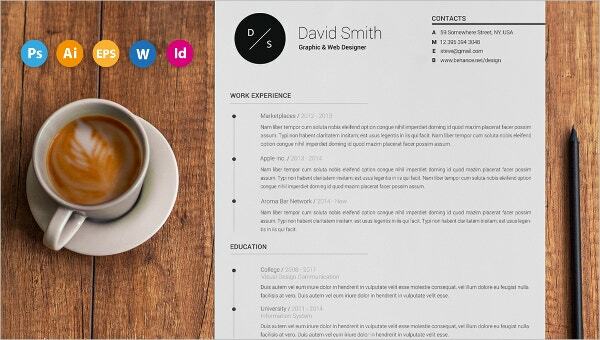 These templates act as guidelines to make the perfect resume. This is a good resume for corporate flight attendant format that draws attention to details like work experience, training, skills and achievements along with the timeline. It is perfect for private flight attendants and corporate ones as well. You may also see Construction Resume Template. 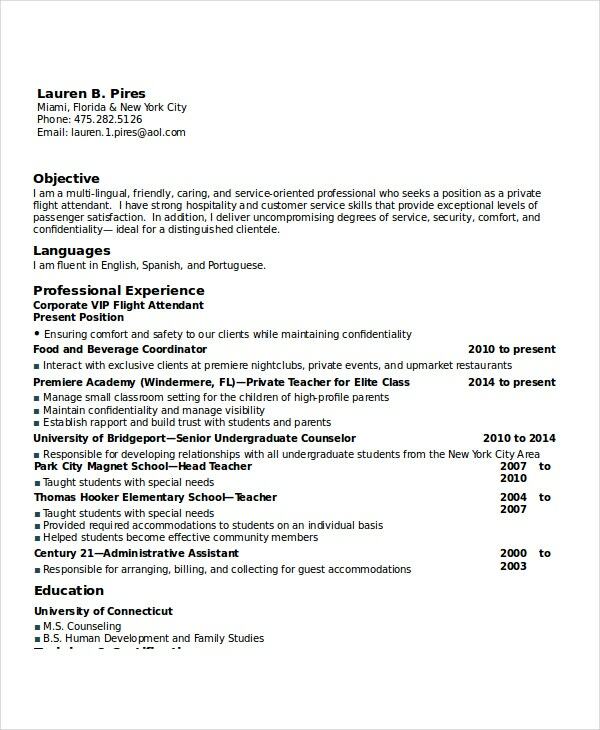 This template is a package of 6 original examples of resumes of corporate flight attendants. Each example covers all necessary details like past positions held, career statement, personal details, academic qualification, and referees. It can be used for cabin crew positions and corporate and private flight attendants. 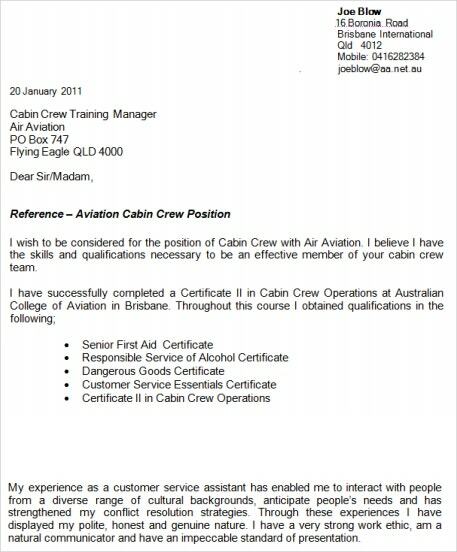 This is a complete guide for developing a perfect document to get that cabin crew, entry level attendant or private flight attendant job. It consists of sample resumes, helpful tips, and resources. 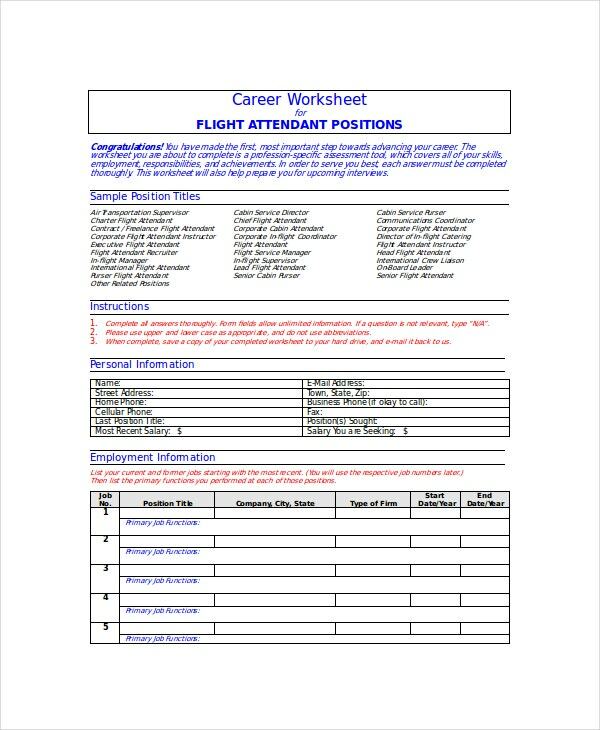 This is a basic MsWord based template, yet it fulfills all flight attendant resume objectives. It includes sections to enlist license, management experience, flying experience, personal particulars and is perfectly organized for experience flight attendant position, corporate and cabin crew as well. This MsWord based template is a great assessment tool and comes with a complete set of questionnaires to authenticate your skills, employment, and personal details. 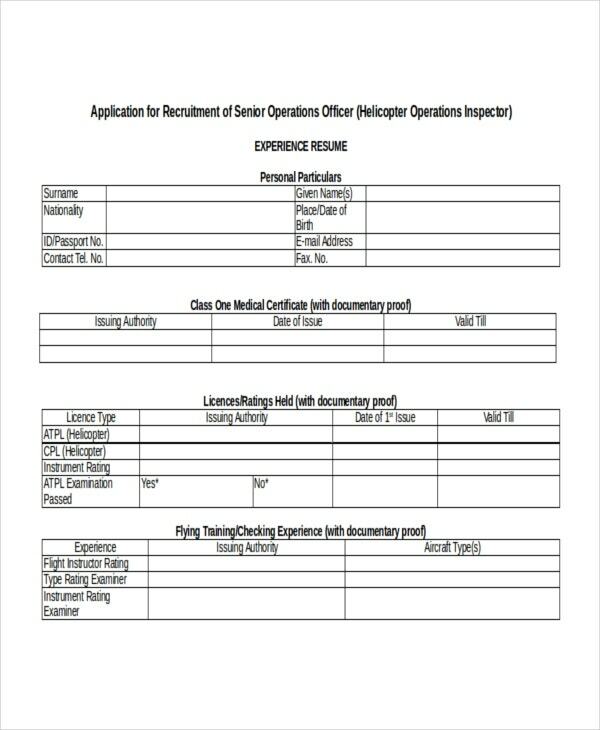 It is perfect for head purser resume, Pilot resumes, Communication Co-coordinator resumes, and International Flight Attendant resumes. You may also see Project Manager Resume Templates. Personal Information-This bit will include your Name, Email Address, Complete Current Residential Address, Business Phone, Cellular Phone, Fax, Last Position Held, and Position Sought. Employment Information- It’s better if listed in a chart format. It will have details of the total number of jobs with position, company name, and type of firm, start year and end year dates. Miscellaneous: This includes sub-categories like- Training and license, Area of expertise, Emergency Procedures, Aircraft and passenger safety & security. A resume shouldn’t be too long or too short- It will vary greatly depending on the position you seek, like for management it has to be filled with objective details whereas for a flight attendant position, it has to have a great first-page impact with a snappy career or skill and training details. 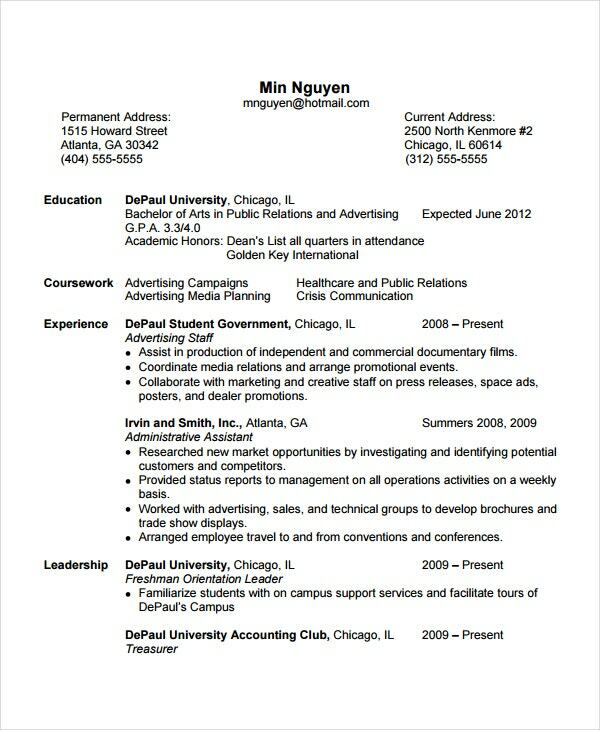 You may also see Federal Resume Templates. Shouldn’t give the vibe of trying too hard- It must mention all achievements subtly along with the skills without being confusing. Responsibilities and achievements are two different aspects and they mustn’t get mixed up. Culture discrimination- If the language of communication is not native, there can be a huge issue as even though certain sentences can seem grammatically correct, culture wise they can seem a bit strange. Relevance is the key- Highlighting skills like fluency in a particular language can be tricky. Instead of simply mentioning fluency in a certain language, it can be framed in a sentence to show how your skill in that language has been of use in your past job. Not sticking to facts- Providing an excess of information without proper documents can be a threat. Employment gaps- Remember to account for the time interval between two consecutive past jobs. Social media disasters- Yes, they would check your social media presence, so you can’t have things like offensive statuses and pictures that can be visible while wearing the flight attendant uniform. Just remember to mention the details that are of relevance to the position applied for and nothing else that can seem like “too much information”. It’s highly recommended to inform about achievements, training, and skills gathered in either short sentences or objective questionnaire pattern. Also adding information about influential referees at the end, if available, can help your case.